Many people have asked about the whirlpool/immersion chiller technique that I've described on the B3 Forum and on The Brewing Network show, so I thought I'd do a page to describe it. Q: Doesn't a plate chiller like the Therminator or a counter flow chiller chill faster? A: No. A good sized immersion chiller has as much surface area as the best of those other chillers. For example, the surface area on the immersion chiller I use has more surface area than the Therminator. The math is simple, the more surface area in contact with the wort, the faster you can transfer heat. It doesn't matter that you're flowing a little bit of wort through the counter flow or plate chiller at a time. In fact, that is less efficient, as the wort eventually reaches the temp of the chilling source (the tap water) and it no longer chills the wort or has any effect at all. In the whirlpool method, you're constantly exchanging cooled wort for hot wort across the entire chiller surface. Q: Doesn't a plate chiller like the Therminator or a counter flow chiller chill to a lower temperature? A: No. No chiller out there can chill any lower than the source of the cooling liquid. The way all of them work is to transfer heat from one liquid to another. It is only going to get as cold as the coldest liquid. All of these are the same in that regard. Q: Doesn't this use more water? A: No. For the same reason none of the chillers goes colder than another. Yes, you can waste water by running it at a higher volume than you need, but that you can control. Q: I already have a counter flow chiller. Why would I switch to this method after spending all that money? Ability to control the final temperature more precisely. The first three are based on the fact that you're chilling the entire wort at one time. With a counter flow or plate chiller, you let the bulk of the wort sit at near boiling temperatures while you chill a small amount. Sitting at near boiling will continue to isomerize the hop acids and drive off the volatile oils that good hop aroma and flavor depend upon. A number of folks have noticed that hop aroma decreases on switching from an immersion chiller to a counter flow This is the reason. By contrast the whirlpool immersion chiller knocks enough heat off of the entire wort in the first minute or two to retain that beautiful hop character. If you're going to use a counter flow or plate chiller, better buy yourself a hopback. The same thing applies to DMS( Dimethyl Sulfide). DMS is often described as a cooked corn aroma that often plagues lager brewers. The thing is, the lighter pilsner malts contain more SMM (S-Methylmethionine), which gets hydrolyzed to DMS during the boil. Yes, this gets driven off, but unless you're doing 100 minute or longer boils, there is still some SMM left behind. The neat thing is, if you can get the temperature of the wort below 140F (60C), then SMM will not be converted to DMS. The whirlpool immersion chiller will drop the temp of the wort below 140F (60C) very quickly, resulting in far less DMS in the finished beer. On the other hand, counter flow and plate chillers continue to hydrolyze SMM into DMS while sitting there at near boiling. The other benefits are that you can control the temperature more precisely with this chiller. Brewing a Belgian and want a warmer temp? Just watch the thermometer and stop when it gets there. Want to get to lager temps? Recirculate some ice water and you can get there too. I could never get very precise control with the counter flow chillers I've tried. This is really easy by comparison. In addition, if you get the temp down to pitching temperature, you can leave all your cold break in the kettle. A real bonus for lager brewers. Q: Can't I do this same thing using my counter-flow/plate chiller? A: Yes, you can. Several people have reported good results using their counter-flow devices. Just run the output from the device back into the kettle. You'll probably get less of a whirlpool effect, but the chilling should be just as good, no DMS and great hop character. Q: Are you selling these? A: No. I have no financial interest in this at all. I think you could make this yourself fairly easy without ever buying anything from a homebrew shop. The basic parts are an immersion chiller, a pump, and a hunk of tubing. I mention the products I own, just in case you're wanting to do it exactly like me for some reason. A: What I've done is combine an immersion chiller and a whirlpool, to rapidly cool my wort and leave the cold break behind. 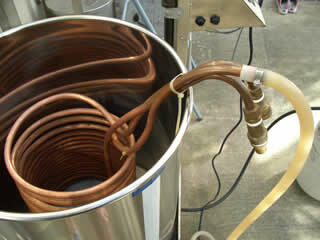 The action of moving the hot wort across the chiller coils results in a very rapid chilling of the wort. 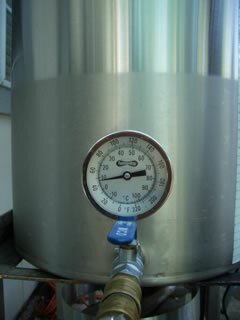 The basic setup is that I put my immersion chiller in the boil pot with 15 minutes remaining in the boil. I connect my pump to my kettle spigot (out) with a length of tubing. From the pump output it goes through a hunk (about 2 feet) of the silicon tubing that B3 sells with their systems. This hunk of tubing is attached to a piece of copper tubing with a hose clamp. The tubing has a gentle curve to it and goes underneath the surface of the wort, just inside the coils of the immersion chiller. Although the pump is clean, and has been pumping 170F+ water for the past hour during the sparge, I turn it on for a few minutes to recirculate the wort through it and heat sanitize the setup. 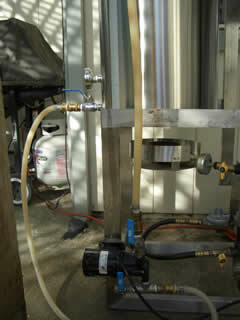 When the boil is complete, I turn on the pump and the chiller water. The temp drops more than 100F in 3 minutes, using one of the beefy, B3 Super Chillers. It is 50' of 1/2" copper, which is a huge amount of surface area. The rest of the drop (another 50F or so) takes longer, but it is still as quick or quicker than any counter-flow I've used. I watch the thermometer until the temperature is where I want it for pitching, then I turn off the water and the pump to let everything settle for 20 minutes. This allows me to rack clear wort to the fermenter and leave all the trub behind in the kettle. If you don't care about it settling, you can just run it off at that point. There are many advantages to this technique. The first is that you're cooling the entire wort below 140F in about a minute or two. Below 140F you're not going to keep generating DMS like you will with a plate chiller or counter flow chiller. If you're into clean german lagers, this is a critical factor in success with this style. The other huge advantage is leaving the cold break behind. With a counter flow chiller or plate chiller you're sending all that cold break into the fermenter and you're going to need to get rid of it if you want the best lager possible. With the whirlpool chiller, the trub forms a nice cone in the kettle and you can leave it behind when you transfer to your fermenter. I used to have several counter-flow and convoluted counter-flow chillers in my brewshed, but I got rid of those because I can't see any reason to use them any more. 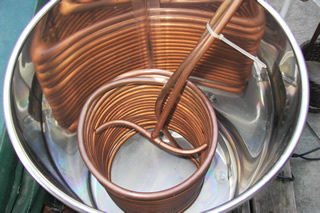 An overview shot of the boil kettle with the chiller, lines, and pump in place. Notice the wort exits the kettle from the valve on the left, goes through the pump at the bottom, which pumps it back to the top of the kettle, inside the immersion chiller. (I used to have the pump directly connected to the kettle, but the difference in flow is negligible when using a couple feet of tubing.) You can buy this type of tubing at www.morebeer.com. Keep it as short as you can, but don't end up with any kinks in the line either. Here is a better shot inside the coil. 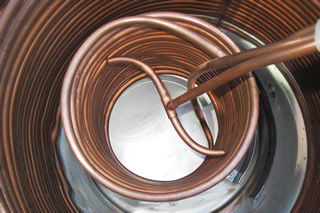 You can see where the copper line leads inside the coil to return the wort. The idea is to force the wort through the coils for more rapid chilling. I was very happy to find that this setup resulted in a very fast whirlpool also. Ideally, I think having a coil that was the same diameter as the inside of the kettle would be perfect. Right now the coil does get in the way of the trub pile a little, though it is much better than you'd think. Again, the T worked really well, but a single line return works just as well. The important thing is the angle of attack of the return. It should be between 30 and 45 degrees off the kettle side. Play with it and you can get a really fast whirlpool going. Here is the whole thing during a brew session. Notice, the cover needs to go on the kettle and you have to hook up your chilling water and waste water line like a normal immersion chiller. 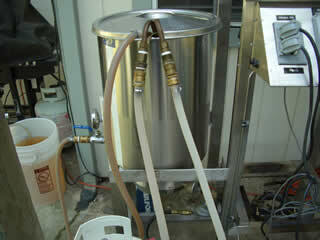 As I mentioned in the text above, I love this setup for its ability to chill wort down to lager pitching temperatures. As anyone who knows me will tell you, I like to pitch my lagers at ~43F (6C). And I also don't like cold break in my lager. This setup lets me get the wort nice a cold, plus leave the cold break behind. 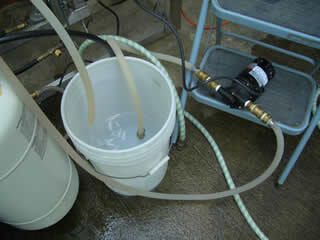 In this photo, I'm using a second March pump to pump ice water through the chiller and back into the bucket. The bucket starts out with a bunch of ice from the ice maker in the fridge and about a half gallon of water. Q: Has anyone else tried this yet? "JZ, It's been a few months since I told you that I thought the Whirlpool Immersion Chiller (WIC) was the best thing since sliced bread. I'm still using rock salt with your design for chilling to lager temps, but have eliminated that step on ales. It's plenty fast without rock salt if I'm chilling to ale temps for 5 gallon batches, especially now that it's cold in Indiana. I took a 5 gallon batch from flame out to 65 degF in 5 minutes this past Saturday. Wow! Thank you for sharing your ideas through the mrmalty website." I think that is a great story and it makes me feel like the time spent putting up these pages is worth it. It is really neat to share a little information and help a brewing brother or sister make better beer. Very cool.